President Buhari joins all sports-loving Nigerians in commending the athletes for doing the country proud by winning 12 medals and setting new records, which made them the top-performing African team at the 2016 games. 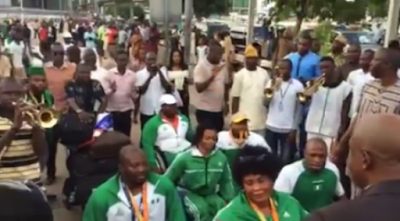 The President extols the resilient spirit of the Nigerian Paralympic athletes, who were able to excel in the face of adversity. Buhari applauds the athletes for their tenacity, focus and determination, which has brought glory to the country. The President also extends gratitude to all the officials and trainers of the Paralympic athletes, who made sacrifices and persevered to fly the country’s colors.